When Rehab Might Help An Addict — But Insurance Won't Cover It : Shots - Health News Federal law requires insurance firms to cover treatment for addiction as they do treatment for other diseases. But some families say many drug users aren't getting the inpatient care they need. 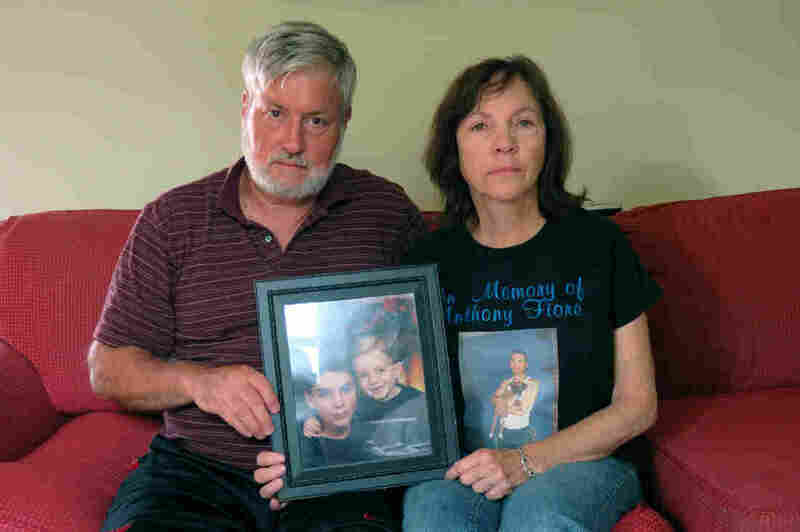 Cris and Valerie Fiore hold one of their favorite pictures of their sons Anthony (with the dark hair) and Nick. Anthony died from a heroin overdose in May 2014 at the age of 24. Cris Fiore's eulogy described his son's death as a shock, but "not a surprise." Anthony had been addicted to heroin for years. And until the prevailing thinking changes, these parents say, progress will only be made on the edges. "It's taking into account the patient's health and how they respond to those treatments," she says. "There are many cases where, if patients need additional care and support, that is provided to them." Valerie Fiore is skeptical; she says Anthony met the criteria for a longer stay. Do Insurers Treat Addiction Like Other Illnesses, As Required? Under a 2008 federal law, insurers have to consider drug and alcohol addiction the same as any other medical problem, as far as access to treatment goes. The Department of Labor says it has investigated at least 140 claims in which a patient's parity rights were violated. All those claims have been resolved through discussions with the insurers, the agency says. But advocates say the information isn't public, and no fines have been issued. So far, Fiore has collected more than 30,000 signatures online. Many of the petitioners say they're endorsing the change on behalf of a relative, or a friend or themselves.